Gone are the days when there is no choice for the beer lover – now we even have a choice when choosing a non-alcoholic beer. This industry is driven by the middle eastern market. There is a huge market for malt beverages in countries where the consumers faith does not permit them to drink alcoholic beverages. Often the words non-alcoholic beer are substituted by malt beverage because beer has a connotation with alcohol. 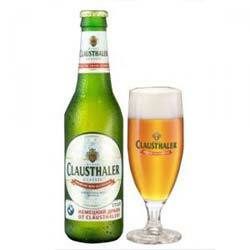 I remember Clausthaler on every menu during my student days in Leipzig and Bremen in the 1990’s. Drinking and driving was a taboo, even then. Bitburger Drive, ERDINGER Alkoholfrei – delicious taste of wheat beer without alcohol – definitely one of my favourites. Super Bock has both a regular (and a dark) non-alcoholic beer – available at Liquor City and most decent liquor stores. Bavaria has a range of flavoured non-alcoholic beers and malts. My favourite non alcoholic beer is Gerstel, available at Shoprite Checkers.